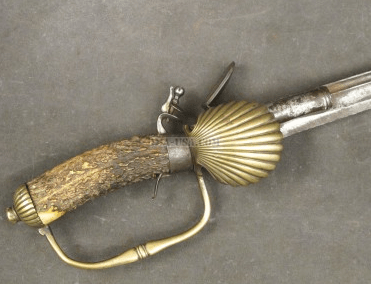 A FINE REVOLUTIONARY WAR PERIOD FRENCH? OFFICER’S HANGER, ca. 1770: In overall fine lightly cleaned condition. The single edge, back-sword type, 32″, fullered, spear-point blade with its original cutting edge without nicks or significant abrasions. The blade with scattered light pitting and discoloration: the ricasso, en suite. Bronze hilt with a rounded, raised-border, cross-guard with a faceted acorn-shaped upper qullion and a faceted ball type pommel of French N.C.O. form. Spiral-type bronze grip with an untouched/tarnished age-patina; and the knuckle-bow and capstan-type pommel with matching mustard-toned surfaces. In overall fine lightly cleaned condition with a straight blade, 45% polish and a silvery-gray toned patina. The bronze hilt with smooth, copper-toned surfaces with generally sharp contours and smooth surfaces: guard rattles, slightly. 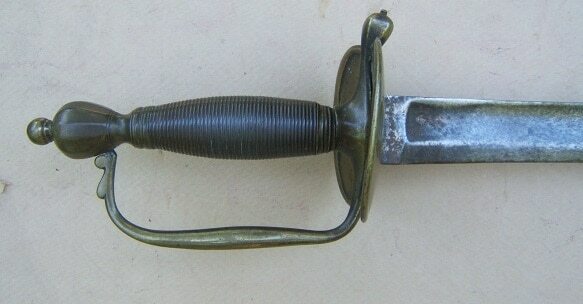 A very nice example of a Revolutionary War Period French? 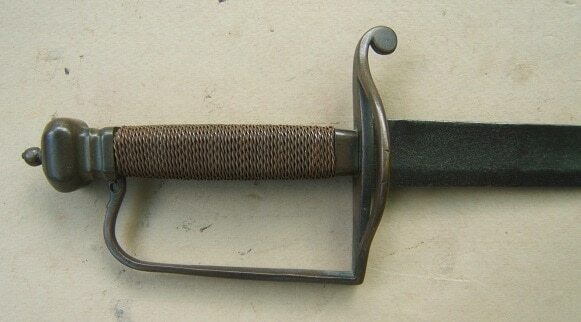 Officer’s Sword/Hanger, ca. 1770. For a similar example, please see G. C. Neumann’s: “Battle Weapons…”, pg. 313. Overall length, 38 1/2”.